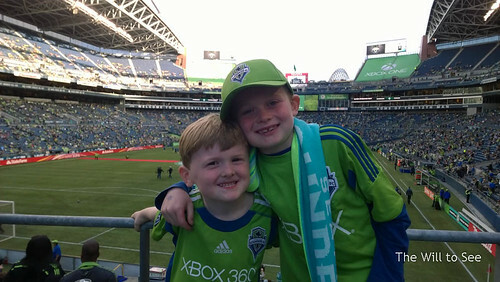 Last fall we took the family to a Seattle Sounders FC game, the local Major League Soccer team. Our seats were way up in the third deck and Will was unable to see the game. At halftime Jim found some seats on the lower level that were not occupied and asked an usher if we could sit there, letting him know we had a vision impaired child. They gladly let us sit there and Will was able to see the game much better. The boys really enjoyed the seats and the game from that perspective. The Sounders have been a marketing machine, drawing averaging more than 40,000 fans per game – more than twice the fans than the team with the second highest attendance. And they have done all this in only five years of existence. The games are fun and family friendly, with activities for kids before the game around the stadium. They run soccer camps throughout the region that kids love and are attended by members of the team. They even take time to sign all of the kids’ camp shirts. After that game we decided to get a partial season ticket package for this season provided we could get seats that would work for Will. 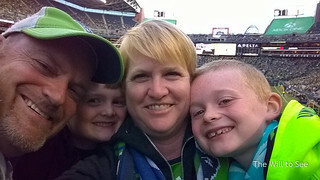 The Sounders not only found seats on the lower level, they offered us front row tickets for a significantly discounted price – all without asking for proof of disability. We didn’t feel it was right to take front row seats so we found great ones behind one of the goals elevated above the field for easy viewing (even when the fans stand, which they do for the entire game). A few Saturdays ago we had our first game of the season and the seats were perfect. We are behind the goal where the Sounders are on offense in the first half and Will was able to see his favorite player, Obafemi Martins, score the first goal right in front of us. We love the way he says Obafemi’s name. Up until now we hadn’t really thought about asking for seats to help him see at events. He is just now really starting to watch games. We learned through this process that if you don’t ask you will never get what you need. So we will continue to speak up and advocate for him and the Sounders proved, once again, why they are a world class organization by which other franchises will model their businesses. We are lucky to have them as a part of our community. Scarves up to you, Sounders!